I came home early from work to meet my sons and their sitter, so we could watch the Antares launch. I got home about seven minutes before the launch, put NASA TV on via AirPlay to the Apple TV in my living room, and sat down to watch. Jimmy and Peter were excited to see this launch and to see the rocket in the sky, in part because they saw Reid Wiseman appear via teleconference from the International Space Station to the RPI Reunion on October 10, they knew that Antares was a supply mission going to ISS, and that Reid would play a big role in making sure Antares docked correctly. The plan was to watch the launch, then go out 90 seconds to two minutes later, and look for the rocket and its bright tail flying off to the southeast, over the Atlantic and into space. The countdown hit zero, the rocket lifted off and cleared the tower. It looked good. My sons Jimmy and Peter ran out the front door to see if they could see the Antares. Peter is five years old, and he has no concept of how long 90 seconds is. Our sitter Joan and I were watching still watching the rocket trying to climb out from the launch pad. The next thing we knew, there was a bright flash from the first stage of the rocket, the rocket stalled in its climb, and started falling almost straight back down but tailing slightly off to the north. Seconds later a big explosion happened, although the explosion wasn't obvious right away due to the camera angle that NASA chose for that part of the ascent. I ended up calling Jimmy and Peter back in from the driveway, saying, "There was a problem." 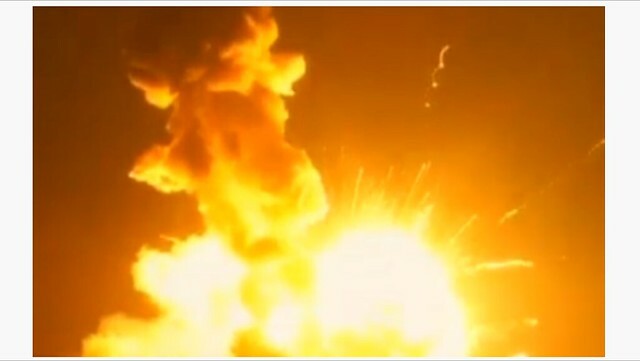 I was glad that NASA TV didn't show the explosion over and over, like the networks did 10 minutes later. I was also glad that the fire, which NASA did show, was minimized in size by the lack of reference points in the camera shot. That would have indicated how huge it was. The video that CNN showed later that was taken from across the bay did a much better job of illustrating how large the explosion had been.